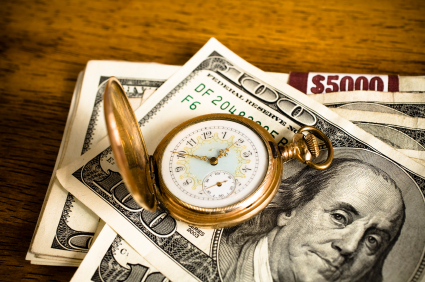 "Remember that time is money" is another very famous quote attributed to Benjamin Franklin. As a statesman, scientist, and philosopher, many of his maxims are known and used in every day conversation. This particular metaphor has remained an important lesson in finance and business. First Use of "...Time is Money"
As you have desired it of me, I write the following hints, which have been of service to me, and may, if observed, be so to you. Remember that TIME is money. He that can earn ten shillings a day by his labour, and goes abroad, or sits idle one half of that day, tho' he spends but sixpence during his diverson or idleness, ought not to reckon that the only expense; he has really spent or rather thrown away five shillings besides. This is just one of the many quotes for which Benjamin Franklin is known. Besides contributing to the country as a patriot during his life time and as a scientist, he also left us with many memorable maxims to help guide us. "Who Said \"Remember that Time is Money\"?." YourDictionary, n.d. Web. 20 April 2019. <https://quotes.yourdictionary.com/articles/who-said-remeber-that-time-is-money.html>. “Remember that time is money” is another very famous quote attributed to Benjamin Franklin. As a statesman, scientist, and philosopher, many of his maxims are known and used in every day conversation. This particular metaphor has remained an important lesson in finance and business.